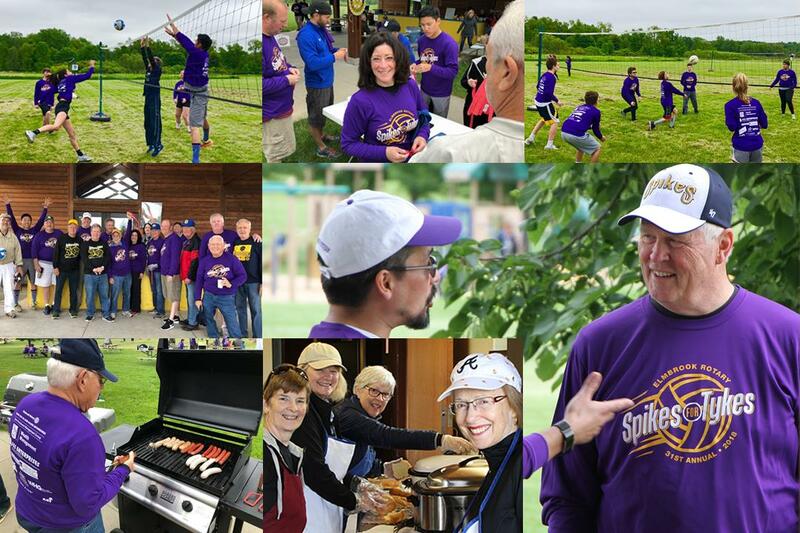 On Saturday June 1st, we'll be having our 32nd annual “Spikes For Tykes Volleyball Spiketacular” at Mitchell Park in Brookfield and the day is sure to be filled with a whole lot of fun, food, and Rotary fellowship! Spikes has been a big success for over 31 years because of the generosity and involvement of businesses, individuals, students, and Rotarians that have helped raise over $750,000 since it began. Last year, we had over 40 playing teams and over 100 sponsors who donated their time, talents, and athleticism. We are proud to announce that for 2018, we reached our goal of $50,000 that will be going directly to worthy causes and programs in Brookfield, Elm Grove as well as throughout Southeast Wisconsin and the world. If you donated or took part in Spikes this year, we THANK YOU for making this one day event have an impact for a lifetime. This years Event Chairperson and Elmbrook Rotarian Mike Hogan, thanks everyone for your past donations and is looking for your support in our 32nd year of Spikes. Together, we will continue to make Spikes bigger and better than ever! Hope to see you in June! What is Spikes for Tykes? Spikes is THE major fundraiser of the Elmbrook Rotary Club and is a fun-filled day of volleyball. Started in 1988, it initially benefited Polio Plus, a Rotary International initiative to eradicate polio worldwide. Since then the proceeds have been directed to the Child Abuse Prevention Fund, the Sharon Lynne Wilson Center for the Arts, and now to numerous charitable causes. Since inception, Spikes has raised over $750,000. See the organizations that benefited from donations raised at the 2018 event. The volleyball is mostly recreational and FUN, where each registered team plays for one hour against a team they have requested or a team assigned based on skill level. Teams are fielded by local businesses, local high school teams and clubs, church groups, families, friends, and Rotary and other service clubs. Spikes is a time for team building. The officers of your club, members of your team or staff, or employees of your company will bond as a team during this event. Couple the volleyball with a picnic or snacks to complete the day. Food and beverages are available at the picnic shelter. WHERE DO THE TEAMS COME FROM? Spikes funds come from sponsorships, plus concessions and a raffle on event day. In addition to the team sponsorships, major sponsorships, ranging from Silver Sponsor to Participating Sponsor, are encouraged. Spikes 2019 will be held on Saturday, June 1, from 9:00 a.m to 1:00 p.m. at Mitchell Park in Brookfield, Wisconsin. This location provides a great family atmosphere that’s perfect for spending a day in the park. Click here for a map with the event location and for more information please contact the 2019 event Chair: Mike Hogan at mjhogan53213@gmail.com.